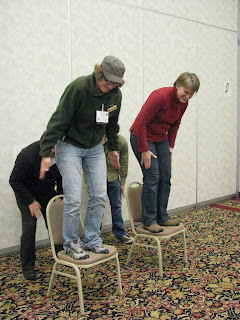 Taking Flight: Flying Wild at Conferences! In the education field October is the month for state conferences! In mid-October I traveled up to Ashland, WI to attend the Upper Midwest Green Schools Conference at Northland College and a week later I traveled over to Eau Claire for the Wisconsin Association of Environmental Education (WAEE) Conference. These conferences provide a wonderful opportunity to network and promote REGI's educational programs to new schools. After a conference I always feel so re-energized! My head is spinning with great new ideas of how to improve REGI's education department and how to strengthen REGI as an organization. It also allows REGI the opportunity to be part of bird education on a state wide level. At WAEE I presented with Susan Schuller from Wisconsin Center for Environmental Education. 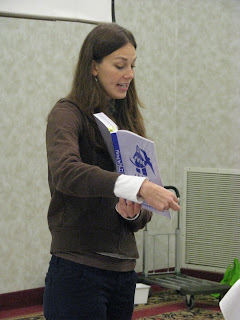 We gave a fun hands-on workshop on Flying Wild An Educator's Guide to Celebrating Birds. Flying Wild is new national activity guide for teachers to introduce middle school students to bird conservation through classroom activities. It supports educators by providing interdisciplinary, standards based curriculum to get kids excited about the importance of migratory birds and their conservation. Our session filled up with 12 people in attendance to be trained on Flying Wild activities! 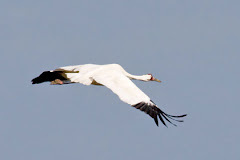 Flying Wild is sponsored in Wisconsin by the Wisconsin Society for Ornithology and Wisconsin Bird Conservation Initiative (WBCI) Education Committee. Susan and I are both members of WBCI's Education Committee and are excited to get these wonderful activity guides into hands of teachers and educators across the state. 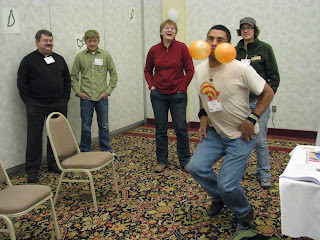 As you can see these educators were having a lot of fun trying out some of Flying Wild's activities! Part of REGI's mission is to educate the public on bird issues. I wish REGI could visit every classroom in the state! Since that isn't really possible it is important for us to partner with other bird organizations to help promote bird education state wide. Partnerships truly make REGI stronger and help us achieve our broader educational goals. I met so many wonderful teachers and environmental educators at both conferences this month! It it nice to know that their is an entire network of teachers and educators out there to help you out with a new idea or problem. And a special thanks to Susan Schuller for letting me be her co-presenter for Flying Wild. Left: Four more educators are trying their hand at drumming like a grouse! Great Workshop Nicole!! Thanks for your help.